Sai Baba has special love for children in His heart. This has been read and very well understood in related articles earlier posted. Though we all are children of Sai Ma but undefined, pure love flows for small kids in Sai Babas heart. Sitting in Shirdi he sees the whole world with his lakhs of eyes and saves with thousands of hands. The composer of a very beautiful song Sainath Tere Hazaron Hath of the movie Shirdi Ke Sai Baba has very well described this. Today while searching Sai Sarovar for a topic to translate I came across a small but heart touching incident which I am presenting for all of you. A house was been constructed at the end of a lane of Shirdi. The ground was being dug in order to fix the pillars. The pit was about 5 feet deep. Soon monsoon season started and the work of construction was stopped as water accumulated in the pit dug for construction. One day it was raining heavily. Meanwhile a boy came playing in the water. He had a big umbrella in his hand. The umbrella was big and the boy was small. The boy played in the water and somehow handled the umbrella. The lane was full for rain water. One could not make out the pits on the road easily. Thus the boy fell in the deep pit. 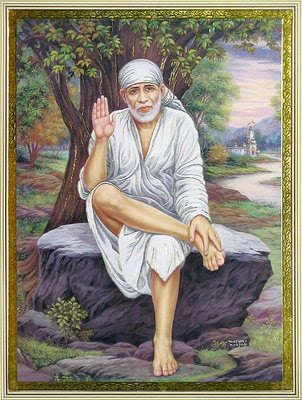 Many people of Shirdi saw him falling, so they ran towards him. When they reached near the pit, they saw the boy coming upwards as if climbing stairs. They asked the boy how he managed to come out of such a deep pit. He answered Sai Baba had submerged a ladder in the pit and I came up by climbing it. Source : Translated from Gujarati Book "Sai Sarovar"